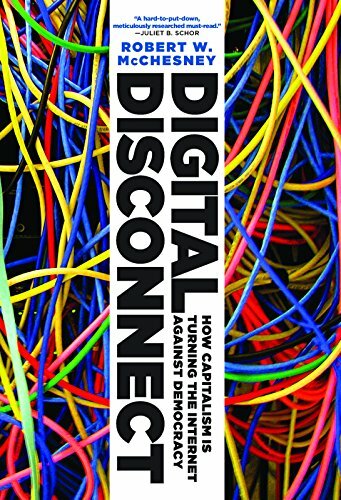 Hailed as Âimportantâ (Truthdig) and praised for its Âexcellent insightâ (Patricia J. Williams, The Nation), Digital Disconnect, by activist and Âexemplary public intellectualâ (Choice) Robert W. McChesney, skewers the assumption that a society drenched in information in a digital age is inherently a democratic one. A prescient examination of the relationship between the Internet and the economyÂone that has become even more relevant since its publication in hardcoverÂthe book argues that capitalismâs colonization of the Internet has spurred the collapse of credible journalism and made the Internet an unparalleled apparatus for government and corporate surveillance. ÂA provocative and far-reaching account of how capitalism has shaped the Internet in the United Statesâ (Kirkus Reviews) and Âan excellent analysis of the problem where a medium with the capacity to empower people is itself becoming a tool of social controlâ (Daily Kos), Digital Disconnect is both a groundbreaking critique of the Internet and an urgent call to reclaim the democratizing potential of the digital revolution while we still can. About: Hailed as important” (Truthdig) and praised for its excellent insight” (Patricia J.